Savor a legendary experience at 1919 Kitchen & Tap in Green Bay. Tackle home style favorites and superb service in our dining room or pub. Watch a game on one of our 138 TVs. Catch the Packers away games or just hang out with friends. The whole place is bursting with Packers history, right down to the servers who are trained in the history of the team. Food is very average and very over priced. Just a warning that if you happen to leave your credit card there by accident and call back looking for it, it will have been destroyed. So I am told by the sarcastic rude manager when I called to ask if they found it. I have never heard of this practice at a restaurant. Great respect for your clients! For dinner I decided to go the newly opened 1919 Kitchen &Tap restaurant, which is located in Lambeau Field on the 1st floor atrium, which is situated on the West side of Green Bay. The interior of the restaurant is grand in size its décor is modern rustic industrial. It has an open concept with clear walls and windows that surrounds it. There is a massive bar which has 80 different taps, a full bar and a nice wine list. There are many tables and booths for dining and televisions every where. The atmosphere of 1919 is warm, casual and fun. My server came immediately after I was seated by the host. She introduced herself took my beverage order and automatically brought me a bottle of ice water with a mason jar glass. 1919 menu is gastro pub food with nice variety of entrees for example, elk, and venison. After I was brought my cocktail I inquired about the different items on their menu and my server was very helpful and knowledgeable. I finally decided on a small plate of Lamb meatballs for $8.00 and the Cobb salad for $11.00. 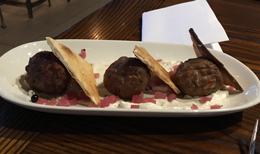 My meatballs had a pleasant presentation on a white plate with triangle pita slices leaning on each meatball with tzatziki sauce spread on the bottom. The lamb meatballs had a delicious flavor but they were just a little on the dry side. My cobb salad was colorfully presented in a white bowl and looked tasty. 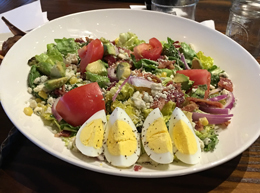 My salad consisted of butter crunch lettuce, peppered bacon, red onion, gorgonzola, tomato, boiled egg, with buttermilk parsley dressing. I loved that the salad was all chopped for easy eating. The salad was large in portion and was scrumptious with the buttermilk dressing which did not over power the ingredients. 1919 Kitchen & Tap is open everyday from 11:am – 10:pm they offer different specials daily and have live music on weekends.